During the month of November, the Church is particularly mindful of her children who are suffering in purgatory. In addition to the Requiem Mass, the Sacred Liturgy contains a treasury of intercessory prayers and rites which are offered and performed to benefit the members of the Church Suffering. 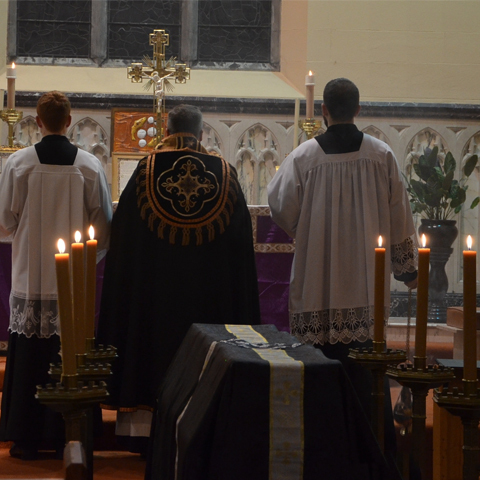 One such ceremony is the Absolution, which is performed following the Requiem Mass. Despite its name, this ceremony does not confer absolution on the deceased, but is a solemn prayer of intercession on their behalf to obtain relief from the sufferings of purgatory and hasten the soul’s entry into heaven. The prayers of the absolution express the love and care which the Church as a spiritual mother continues to bear for her children after their departure from this life and prior to their entrance into the glory and bliss of heaven. The absolution is performed either in the presence of the mortal remains of the deceased prior to burial, or, in the absence of the remains, on a structure called the catafalque which mimics the size and shape of a coffin. This structure derives its name from the Italian word catafalco, meaning scaffold or elevation, and symbolizes the body of the deceased. This representation of the deceased by the catafalque is analogically comparable to the function of a statue or image in representing the saints or the Blessed Virgin Mary for veneration. The catafalque is covered with a black funeral pall adorned with a cross, in the same manner as the coffin at a funeral Mass, and like the coffin, it is positioned immediately outside of the sanctuary during the exequial ceremonies and is surrounded by six burning candles of unbleached beeswax. Immediately after the Mass, the priest descends from the altar, changes from the chasuble into a black cope, and proceeds with the sacred ministers to face the catafalque. The subdeacon bearing the cross stands at the opposite end, flanked by the two acolytes bearing candles. The responsory is repeated and then the priest and choir alternate the Kyrie Eleison, and recite the Pater Noster silently. The catafalque is then sprinkled with holy water and incensed by the priest accompanied by his ministers. The priest then recites the final prayer of the rite of absolution, from which it derives its name: “Absolve, we beseech Thee, O Lord, the souls of Thy servants from every bond of sin, that in the glory of the resurrection, they may rise to a new and better life with Thy saints and elect. Through Christ our Lord. Amen.” The ceremony having been thus concluded, the priest and ministers return to the sacristy in silence. This rite of absolution is a powerful witness to the Church’s doctrine of purgatory and the value of prayers of intercession on behalf of the souls suffering therein. When assisting at this and the other of the Church’s Requiem liturgies, we are given a tangible connection with the souls of our beloved who have preceded us into the next world. The catafalque by its very nature permits us to visualize the deceased we have known and loved, and prayerfully invoke God’s mercy on their behalf in the context of the public and official prayer of the Church. After the funeral and burial of a parent, spouse, sibling, priest or friend, the Church provides us with a means of remembering and assisting them from this life by piously participating in ceremonies such as the Requiem Mass and Absolution on their behalf.